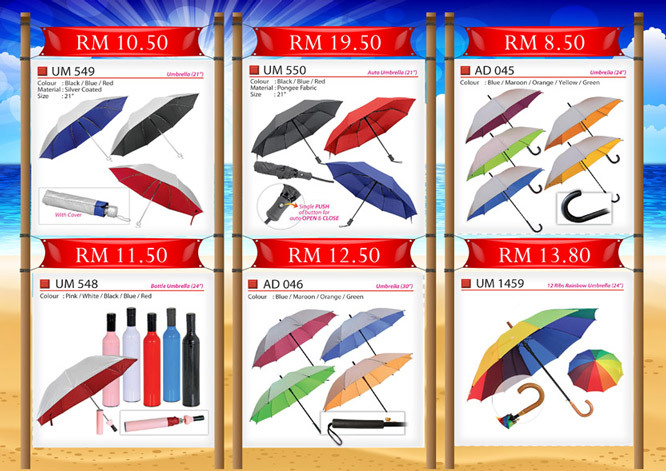 Umbrella Supplier Malaysia – Wholesale ready stock umbrella with logo printing ! Welcome to land at www.umbrellamalaysia.com.my, your trusted name of personalized logo printing ready stock umbrella supplier in Malaysia. We are Malaysia importer of promotional umbrellas with wholesale price. We stock wide range of standard 24 inch umbrella and 30 inch golf umbrella with different style, colour and design. All the umbrellas listed on website can be personalized with logo branding for marketing purpose. As we strive to become the number ONE to supply ready stock promotional umbrella to corporate gift industry, We progressively add new innovative designs every month to cater for customers ever changing taste and demand. Umbrellas with logo branding make good promotional gift as it has very huge printing area and make good corporate gift to clients. It is handy and popular gift especially for climate country like Malaysia. Please feel free to browse through the range of available model online or you may contact us at 03-80703828 to speak with our friendly sales representative for further information. Alternatively, you may download a softcopy of the catalogue here. All of the big firms we know want to promote themselves, it’s a world of competition and everyone wants their company to be ahead of their competent. And we all know there are various promotional items, and they are all useful for the clients and what’s more useful than an umbrella? That’s the reason promotional umbrellas should be every company’s first giveaway to their customers. There can be nothing worse than being caught in the rain or burning sun. So give away your customers and your employees what they need the most. Yes! An umbrella with your logo printed on it. How to select Promotional Umbrella? Have you ever wondered if just one person walks down the street for ten minutes holding a promotional umbrella and makes thousands of people recognize your logo in just ten minutes, and this can make a big difference for your company. Now the question arises how to select a promotional umbrella? There is a wide range of prices and the company’s main goal is to set a budget. The company should be wise enough to meet at least three different umbrella vendors for this purpose separately and ask them to provide samples. Also dealing of rates should be done in a very professional manner. Your umbrella keeps you dry under a sudden rainfall, gives you shadow under the hot burning sun, so in return it demands to be taken care of. Usually we are not very caring towards our umbrellas, so we leave them behind in some restaurant where we stopped to grab some food, or simply let them get ruined. Well, no, one must know how to take care of one’s umbrella, don’t consider your umbrella as a disposable item. Be careful while opening and closing it, and make sure you don’t leave your umbrella behind, once you’re leaving. Below diagram shown the typical construction of an umbrella. The making of the promotional umbrella with logo printing is an artistic job and we should appreciate the beauty of the finished product. You may refer this diagram to have a more details of the umbrella construction. There are many kinds of promotional gifts but umbrellas seem to be the most popular choice among many companies and organizations. This is because it combines both style and function. It is also a perfect give which shows off your company name, logo, tag line, and whatever you decide to put into it. There are many reasons why umbrella as promotional gifts will make you and your business shine like the sun. • Options. Umbrellas give you many options. It comes in different materials although the most popular choice is nylon. It comes in different colors with most popular choices as white, maroon, black, and navy blue. It also comes with different handle materials. There are many options to choose from so you will surely find the perfect one for you. • Size Matters. Umbrellas also come in different sizes too. Bigger umbrellas are actually more popular compared to smaller ones. Many people prefer golf umbrellas too. These umbrellas are bigger and it is even sturdier. Popular color choices for golf umbrellas are black, combination of blue and white, combination of black and white, white, and silver. • Will of the Wind. Windbrellas are also perfect kind of umbrella as promotional gifts. It is designed more for protection from the wind instead of the sun or the rain. It is also relatively lighter compared to other kinds of umbrella. It is perfect for those who love the sun and just need minimal protection from it. Popular choices of color are combination of green and white, combination of blue and white, combination of black and white, blue, moss green, maroon, black, and combination of red and white. • Fold. Folding umbrellas are also popular choice of umbrella as promotional gifts. These are rather practical as these umbrellas are easily folded and you can place it inside your bag. This way, you are ready for sudden change in the weather anytime, anywhere. You also do not have to carry it around by hand or arm. It is functional, it is convenient, and it simply makes life easier. Your promotional gift should speak for you. Like the umbrella, it should come with promises. It tells the people that just like the umbrella, your business or your company wants to keep you safe and protected, that you care for them, that you will be there for them no matter what kind of weather they experience, and that your are willing to keep them safe and comfortable in different situations. As the product carries your brand, it also carries the message wherein you can show your company’s vision so anyone can see it and remember it. You may refer this article to have a more insight information regarding the aspects in choosing a good umbrella. Long ago, if you required an umbrella, you would end up with a lengthy stick umbrella which would possibly be black. However, in recent years a number of latest innovations and fascinating engineering feats have been included in the rain umbrella. Maybe, the most striking choice for an umbrella is the way it is opened. To open and close manual umbrellas, the ring is slid upwards and downwards the shaft, according to the user’s wish. For a lot of years, automatic umbrellas have been available. They pop open when a button is pressed, which is found on the handle. These umbrellas which are packed with springs are very useful and it is faster to open them than a normal manual umbrella. More recently, a number of clever engineers found out the way to create umbrellas which close and open automatically. These provide optimum convenience. Be careful though, as automated umbrellas are machines which are complicated and at times break, becoming stuck when either open or closed. If you want to benefit from an automatic umbrella, it is advisable to get an umbrella of high quality which comes with a lifetime warranty. The twin canopy is another fascinating novelty found in the modern umbrella. This design has slits inside the canopy which overlap. The concept here is to allow wind to flow via the slits instead of getting caught by the canopy, compelling the umbrella to turn upside down. When this happens, it is a sure indicator that you require a new umbrella! A lot of varying features exist in the twin canopy; however, essentially they operate in similar manner and can lessen harm to this precious accessory. A lot of umbrellas with twin canopies are said to endure winds up to 50 mph or 80 kph. Another consideration is whether to opt for a folding umbrella or a normal stick umbrella. Folding umbrellas are available in compact form or ultra compact. The base of these umbrellas telescopes outwards upon opening and offers sufficient coverage for people. It collapses downwards to below a foot in length, making it convenient to carry. Normal stick umbrellas are bigger and more long lasting. A lot of umbrellas are made from nylon as it is durable and available freely, as well as affordable. Pongee is a kind of silk cloth. It is not common to find umbrellas designed solely from Pongee; however, it is possible for you to come across Poly-Pongee. This blend of polyester and silk is utilized more as the silk content is a bit more expensive. The advantage of poly-pongee is that it is lighter in weight. You will also come across some choice umbrellas created from a canopy of polyester. All of these fabrics offer high quality protection from the rain and sun. For specialized imprinting, nylon is prone to holding and reflecting imprints better. If you want to include a logo on an umbrella, making use of a nylon canopy would be best. 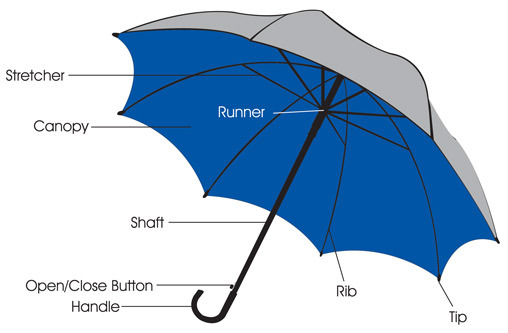 In case you enjoy playing golf when it is raining, you can select golf umbrellas which are purpose designed. They are larger than a canopy of average size and longer than normal stick shaft, with a straight handle. They are also available in a huge variety, in terms of patterns and colours. They are ideal for golf clients and families as well. Doorman Umbrella is another big umbrella to think about. They are purpose designed to be used commercially by apartments and hotels. They look the same as golf umbrellas. However, they have a normal handle which is J shaped and are presented in a variety of colours. They are well designed to last long and are ideal for families also.